Question: How do I learn to see fish in the water or know where to look for them? Answer: Learning where and how to look for fish is vital to your fishing success. First and foremost, a good pair of quality polarized sun glasses is as important as your rod, your fly reel and fly in this endeavor. Many manufacturers make prescription polarized glasses if you need them, and they are worth every bit of what you pay for them. As you probably know, not all polarization is the same, so be sure to get the kind that are specially designed for seeing through the glare off the water. Amber or a copper-rose combination both work well. I wear polarized bi-focal glasses from HaberVision, an on-line company. With the importance of good eyewear established, let’s start this discussion with a reminder that fish like trout are not feeding on the surface all the time, even though that is where we would really like to see them. Biologists say that 80 to 90 percent of what fish eat they eat under the surface of the water, and that some fish species like salmon almost never feed on the surface. That means you won’t always have rising fish to cast to. So, the question becomes where do you look for them when their feeding indicators aren’t visible? Although all of these are good spots to start searching for fish, there are many subtleties and endless varieties in spots like these, so be patient, and keep looking. 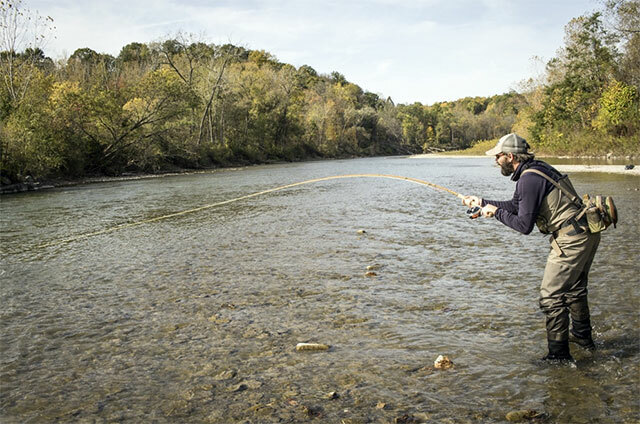 Make a few casts to likely looking places with a nymph or streamer to see if you can tempt a fish that could be hiding there. It is, of course, easier to spot fish if they are rising. Momentary rings, bubbles, or blips can all indicate feeding fish and they provide a dead giveaway to the channels, called feeding lies, where fish wait for the current to bring them food. Obviously, your fly needs to land along the food conveyer belt so the fish will see it. Scrutinize the current flow by focusing your eyes on the water where you last saw the little dimples, swirls, or blips on the surface. Different types of rises can indicate which fly, or which life-stage of the fly, the fish may be targeting. Take a few minutes to analyze the different currents that move toward the rises to see where the fish seem to be located. Then, do your best to place your fly right at the top of that current so that it dead-drifts directly to where the blips are occurring. Careful observation of the rises and a good pair of polarized glasses will reveal such channels to you if you concentrate. Depth, speed, and clarity of the water are all important factors to take into consideration as you search for fish. Each of these elements can differ from day to day, from morning till night, or even from hour to hour if hard rain is falling. Journaling about your experience is helpful to give you have a record of different situations in different places at different times to fall back on for help. Here are a few techniques to help you see fish as you search, whether they are feeding on the surface or not. First, make sure that you are approaching the water quietly & slowly so as not to spook fish. Wear a hat with a good brim. Then, put the sun behind you so that you can look down into the water where fish hold. Try to keep your shadow off the water. You’re much more likely to see fish without all the glare. Take your time to peer through the water and look for things like moving shadows that could be fish, waving tails, or white mouths opening and closing as a fish feeds. All these things are possible to see at times if you are patient. One of the best tips that I ever got to help me to see fish was to watch the surface of the water intently and be ready to “look down look through a slick.” Slicks don’t last very long in a current flow, so be persistent and concentrate. You’ll be surprised at what you can see, if only for a nanosecond. Seeing fish is more difficult in lakes than in rivers unless you are experiencing fish that are rising to the surface of the water to feed on emerging or adult bugs. That’s when you are likely to see fish snouts, tips of dorsal fins or tails, and even sometimes the backs of fish as they pursue their prey. It doesn’t take much to locate them at those times. In other situations you can always look for fish alongside weed beds and in places where underwater ledges or submerged logs occur. See if you can get a copy of a topo map of the lake you are fishing at your local or state fish and wildlife service in order to detect shelves and various depths of the water. Keep in mind that many lakes are best fished with nymphs or streamers because the fish might be mostly feeding below the surface. Making your nymph appear as if it’s starting its journey to the surface like flies called “emergers” is one of the best ways to fish a lake, as is making your woolly bugger take on the appearance of a slow-moving leech. Another clue to where fish might be feeding is simply to watch the birds and see where they are feeding. Often they are taking the same tiny bait fish that the fish are. Learning to spot fish is a never ending challenge, but an exciting one that permits us a peek into the mysterious underwater world. Finding fish to cast my fly to is one of my favorite parts of fly fishing. 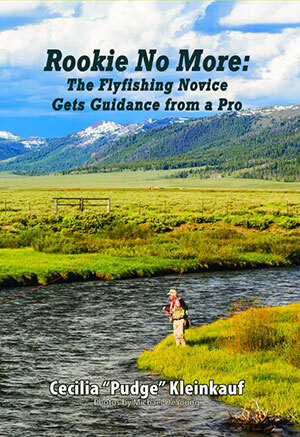 Excerpted with permission from Rookie No More: The Flyfishing Novice Gets Guidance from a Pro (Epicenter Press, April 2016); all rights reserved.